The history of food chemistry dates back to the late 1700s, when many famous chemists were involved in discovering chemicals important in foods. In 1813, Sir Humphry DThe history of food chemistry dates back to the late 1700s, when many famous chemists were involved in discovering chemicals important in foods. In 1813, Sir Humphrey Davy published the first book on agricultural and food chemistry, in the United Kingdom. This book served as a foundation for the profession worldwide and went into a fifth edition. In 1874, the Society of Public Analysts was formed, with the aim of applying analytical methods to benefit the public. Its early experiments were based on bread, milk, and wine. The development of colleges and universities worldwide, most notably in the United States, would expand food chemistry with research of the dietary substances, most notably the Single-grain experiment during 1907-1911. Additional research by Harvey W. Wiley at the United States Department of Agriculture during the late 19th century would play a key factor in the creation of the United States Food and Drug Administration in 1906. The American Chemical Society would establish their Agricultural and Food Chemistry Division in 1908 while the Institute of Food Technologists would establish their Food Chemistry Division in 1995.
avy published the first book on agricultural and food chemistry, in the United Kingdom. This book served as a foundation for the profession worldwide and went into a fifth edition. In 1874, the Society of Public Analysts was formed, with the aim of applying analytical methods to benefit the public. Its early experiments were based on bread, milk, and wine. 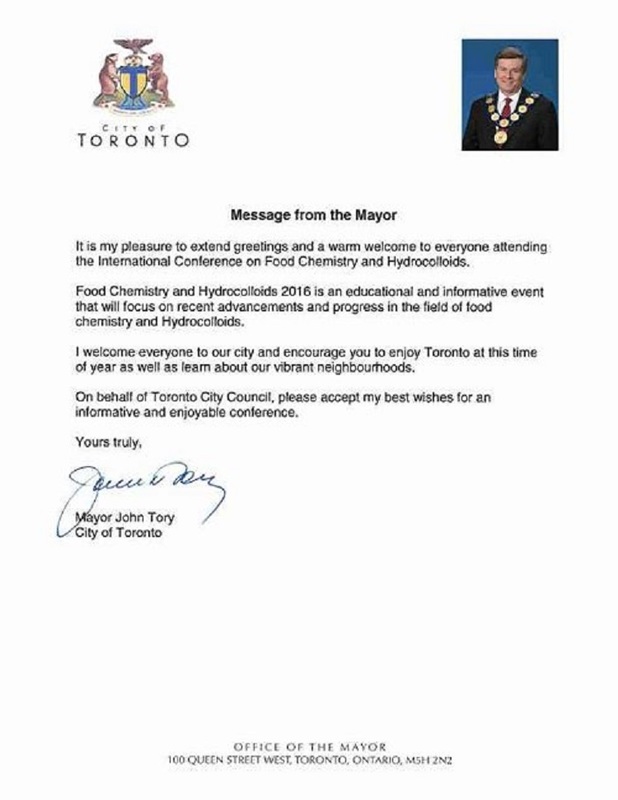 Conference Series LLC Ltd successfully completed the first International Conference on Food Chemistry and Hydrocolloids during August 11-12, 2016 at Toronto, Ontario, Canada and 2nd International Conference on Food Chemistry & Nutrition during July 24-26, 2017 at Vancouver, Canada and 3rd International Conference on Food Chemistry & Nutrition during May 16-18, 2018 at Montreal, Canada. With the successful completion of three annual conferences, Conference Series LLC Ltd is announcing the 4th International Conference on Food Chemistry & Nutrition at Madrid, Spain during November 27-28, 2019. 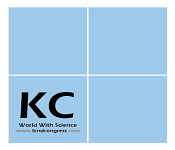 Conference Series LLC Ltd organizes 2000+ Global Events inclusive of 1000+ Conferences, 600+ Workshops and 400+ symposiums on various topics of Science and Technology across the globe with support from 1000 more scientific societies and Publishes 750+ Open access journals which contains over 50000 eminent personalities, reputed Scientists as editorial board members. 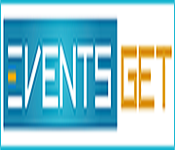 Conference Series LLC Ltd scientific events are the special designed cluster of program that provides a common platform where industry meets academia to discuss the recent issues and happening. It serve as a bridge between researchers from academia and industry enhanced by its well organized scientific sessions, plenary lectures, poster presentations, world class exhibitions, diverse symposiums, highly enriched workshops and B2B meetings. This Food Chemistry 2019 conference will focus on the theme "Exploring recent advancements and its application in the field of food chemistry & nutrition". So this is a valuable and important platform for inspiring international and interdisciplinary exchange of food and nutrition research. This food conference will focus on chemical components of food, their nutritional, sensory, flavor, microbiological and physiological aspects; changes in chemical and biochemical composition and structure during processing, transportation and storage; chemical aspect of food safety and quality, other by-products, and processing wastes; chemistry of agro chemicals, food additives and contaminants, along with their metabolism and toxicology, etc. The Conference will bring together academicians, chemists, scientists, dieticians, nutritionists, engineers, technologists from all over the world to exchange their knowledge and experience on food and nutrition research. We hope you will join us at Madrid, Spain for a fantastic networking experience. 3rd International Conference on Global Food Security, 03-06, December 2017 South Africa; 5th International Conference on Food Security and Nutrition, April 8-10, 2018 Denmark; 3rd International Conference on Food Chemistry & Nutrition, May 23-25, 2018, Canada; 8th International Conference on Food Safety & Regulatory Measures, June 11-13, 2018, Spain. Asian Food Safety and Security Association , Japan; Food Industry Students European Council, Netherland. European Food Information Resource, Belgium; European Food Safety Authority, Italy; Barilla Center for Food & Nutrition Italy; Center for Food Safety United States; Food & Water Watch USA; Food First: The Institute for Food and Development Policy USA; Australian International Food Security Centre Australia. Food Technology is a part of sustenance science that arrangements with the creation form that make sustenance's. Early logical examination into nourishment innovation focused on sustenance safeguarding. Nicolas Appert’s advancement in 1810 of the canning procedure was a definitive occasion. The procedure wasn't called canning at that point and Appert did not by any stretch of the imagination know the guideline on which his procedure worked, yet canning has majorly affected nourishment protection methods. Louis Pasteur's examination on the deterioration of wine and his depiction of how to stay away from waste in 1864 was an early endeavor to apply logical information to nourishment dealing with. Other than examination into wine waste, Pasteur explored the generation of liquor, vinegar, wines and lager, and the souring of drain. He created sanitization—the way toward warming milk and drain items to crush sustenance deterioration and ailment delivering living beings. In his investigation into sustenance innovation, Pasteur turned into the pioneer into bacteriology and of current preventive pharmaceutical. 8th International Conference on Food Safety & Regulatory Measures, June 11-13, 2018, Spain; International Conference on Food Security and Nutrition, Jul 16-17, 2018, Netherlands; 21st International Conference on Food & Nutrition, July 25-26, 2018, Canada; 20th International Conference on Food Security and Nutrition, June 14 - 15, 2018, Austria. 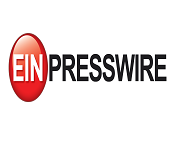 National Frozen Food Association, USA; Institute of Food Technologists, UK; International Association of Food Industry Suppliers, USA; International Bottled Water Association, USA; Asian Food Safety and Security Association, Japan; Food Industry Students European Council, Netherland. Food processing is the change of agrarian items into nourishment, or of one type of nourishment into different structures. Nourishment preparing incorporates numerous types of handling sustenance's, from crushing grain to make crude flour to home cooking to complex modern techniques used to make comfort foods. Primary sustenance handling is important to make most nourishment's palatable and optional nourishment handling transforms the fixings into recognizable sustenance's, for example, bread. Tertiary sustenance preparing has been scrutinized for advancing over nourishment and heftiness, containing excessively sugar and salt, too little fiber, and generally being unhealthful. 5th International Conference on Food Security and Nutrition, April 8-10, 2018 Denmark; 3rd International Conference on Food Chemistry & Nutrition, May 23-25, 2018, Canada; 8th International Conference on Food Safety & Regulatory Measures, June 11-13, 2018, Spain; International Conference on Food Security and Nutrition, Jul 16-17, 2018, Netherlands. Food security is a condition identified with the accessibility of nourishment, and people's availability and moderateness to it. There is proof of being used more than 10,000 years back, with focal experts in developments antiquated China and old Egypt being known to discharge sustenance from capacity in the midst of starvation. At the 1974 World Food Conference the expression "nourishment security" was characterized with an accentuation on supply. Sustenance security, they stated, is the "accessibility consistently of satisfactory, feeding, differing, adjusted and moderate world nourishment supplies of fundamental foodstuffs to maintain an enduring development of sustenance utilization and to balance vacillations underway and prices". Later definitions added request and access issues to the definition. The last report of the 1996 World Food Summit expresses that sustenance security "exists when all individuals, consistently, have physical and financial access to adequate, sheltered and nutritious nourishment to meet their dietary needs and sustenance inclinations for a functioning and solid life. 5th International Conference on Food Security and Nutrition, April 8-10, 2018 Denmark; 3rd International Conference on Food Chemistry & Nutrition, May 23-25, 2018, Canada; 8th International Conference on Food Safety & Regulatory Measures, June 11-13, 2018, Spain; International Conference on Food Security and Nutrition, Jul 16-17, 2018 Netherlands. Food analysis is the control managing the advancement, application and investigation of explanatory strategies for describing the properties of nourishment and their constituents. These diagnostic techniques are utilized to give data about a wide range of attributes of nourishment's. Quality control, or QC for short, is a procedure by which substances survey the nature of all elements engaged with creation. ISO 9000 characterizes quality control as "A piece of value administration concentrated on satisfying quality prerequisites. This methodology puts an accentuation on three perspectives (revered in guidelines, for example, ISO 9001).Elements, for example, controls, work administration, characterized and all around oversaw processes, execution and trustworthiness criteria, and recognizable proof of records. Competence, for example, information, aptitudes, experience, and capabilities Soft components, for example, work force, honesty, certainty, authoritative culture, inspiration, solidarity, and quality connections. Review is a noteworthy part of value control, where physical item is inspected outwardly (or the final products of an administration are dissected). Item assessors will be given records and depictions of inadmissible item imperfections, for example, breaks or surface flaws for instance. Different new conventional and current advancements have been created to deliver the proficient nutritious nourishment and sustenance elements for the wellbeing sustenance details. Late innovation in Food science assumes the indispensable job in changing over the supplement data identified with the client requests in nourishment items. To build up the sustenance with high heath esteem without irritating their flavor, surface, appearance a wide cluster nourishment handling and modern systems must be utilized. These days numerous effective undertakings in sustenance recuperation have been performed for the cost minimization and improvement of nourishment items. Asian Food Safety and Security Association, Japan; Food Industry Students European Council, Netherland. European Food Information Resource, Belgium; European Food Safety Authority, Italy; Barilla Center for Food & Nutrition Italy; Center for Food Safety United States; Food & Water Watch, USA. The live microbial greenery present inside the Human stomach related track keeping the stomach related organ framework solid is characterized as Probiotics. Because of expanded utilization of disease related anti-microbial, the gainful micro biome present inside the stomach related gut likewise gets influenced. In any case, on account of the probiotics supplements, the prebiotics which supplements the useful micro biome and jam the advantageous microbial verdure. Probiotics are by and large talked or characterized regarding microscopic organisms and yeasts, comprehensively the strains Lactobacillus, Bifid bacterium and Saccharomyces. Probiotics offer challenges for mechanical applications. The probiotic thought is keen on piles of different applications in a colossal combination of fields huge for human and creature prosperity. Probiotic things include different mixes, vitamins, cases or tablets and some aged sustenance’s contain microorganisms which impact sly affect the quality of the host. They can contain one or a couple of kinds of probiotic microorganisms. For the most part probiotic things headed for human usage is as matured deplete or given in powder or tablet frames. These containers and tablets are not used for therapeutic applications yet rather as prosperity supporting things. The oral usage of probiotic microorganisms conveys a protective effect on the gut vegetation. Distinctive investigations suggest that probiotics have valuable ramifications for microbial confusion of the gut; anyway it is really hard to demonstrate the clinical effects of such things. The probiotic game plans used for pioneer's loose bowels, hostile to contamination looseness of the bowels and intense the runs give the idea that they have a positive helpful effect. 3rd International Conference on Global Food Security, 03-06, December 2017 South Africa; 5th International Conference on Food Security and Nutrition, April 8-10, 2018 Denmark; 3rd International Conference on Food Chemistry & Nutrition, May 23-25, 2018, Canada; 8th International Conference on Food Safety & Regulatory Measures, June 11-13 2018, Spain; International Conference on Food Security and Nutrition, Jul 16-17, 2018, Netherlands. Food waste or nourishment misfortune is nourishment that is disposed of or lost uneaten. The reasons for nourishment waste or misfortune are various and happen at the phases of creating, handling, retailing and devouring. Worldwide nourishment misfortune and waste add up to between 33% and one-portion of all sustenance delivered. Misfortune and wastage happen at all phases of the sustenance store network or esteem chain. In low-wage nations, most misfortune happens amid generation, while in created nations much nourishment – around 100 kilograms for every individual every year – is squandered at the utilization arrange. International Conference on Food Security and Nutrition, Jul 16-17, 2018, Netherlands; 21st International Conference on Food & Nutrition, July 25-26,2018, Canada; 20th International Conference on Food Security and Nutrition, June 14 - 15, 2018, Austria. Asian Food Safety and Security Association, Japan; Food Industry Students European Council, Netherland. European Food Information Resource, Belgium; European Food Safety Authority, Italy; Barilla Center for Food & Nutrition Italy; Center for Food Safety United States; Food & Water Watch USA; Food First: The Institute for Food and Development Policy USA; Australian International Food Security Centre Australia. Nutraceuticals is a broad umbrella term that is used to describe any product derived from food sources with extra health benefits in addition to the basic nutritional value found in foods. A functional food for one consumer can act as a nutraceutical for another consumer. Examples of nutraceuticals include fortified dairy products (e.g., milk) and citrus fruits (e.g., orange juice. Several naturally derived food substances have been studied in cancer therapies. The diverse types of emulsifier lecithin – powder, two distinctive fixation fluids, granular and powder lecithin. Nourishment added substances will be substances added to sustenance to protect flavor or improve its taste, appearance, or different characteristics. A few added substances have been utilized for a considerable length of time; for instance, saving nourishment by pickling (with vinegar), salting, likewise with bacon, protecting desserts or utilizing sulfur dioxide similarly as with wines. With the coming of prepared nourishments in the second 50% of the twentieth century, numerous more added substances have been presented, of both characteristic and fake cause. Sustenance added substances likewise incorporate substances that might be acquainted with nourishment in a roundabout way (called "aberrant added substances") in the assembling procedure, through bundling, or amid capacity or transport. 5th International Conference on Food Security and Nutrition, April 8-10, 2018 Denmark; 3rd International Conference on Food Chemistry & Nutrition, May 23-25, 2018, Canada; 8th International Conference on Food Safety & Regulatory Measures, June 11-13, 2018, Spain. Food microbiology is the investigation of the microorganisms that hinder, make, or sully nourishment, including the investigation of microorganisms causing sustenance decay, pathogens that may cause malady particularly if sustenance is inappropriately cooked or put away, those used to deliver matured nourishment's, for example, cheddar, yogurt, bread, lager, and wine, and those with other valuable jobs, for example, creating probiotics. Nano-biotechnology, bio-nanotechnology, and Nano biology are terms that allude to the convergence of nanotechnology and biology. Given that the subject is one that has just developed as of late, bio nanotechnology and Nano biotechnology fill in as cover terms for different related advancements. This order demonstrates the merger of organic research with different fields of nanotechnology. Ideas that are improved through Nano biology include: Nano devices, (for example, organic machines), nanoparticles, and Nano scale wonders that happens inside the order of nanotechnology. This specialized way to deal with science enables researchers to envision and make frameworks that can be utilized for natural research. Naturally roused nanotechnology utilizes organic frameworks as the motivations for advancements not yet created. However, similarly as with nanotechnology and biotechnology, bio-nanotechnology has numerous potential moral issues related with it. 5th International Conference on Food Security and Nutrition, April 8-10, 2018 Denmark;3rd International Conference on Food Chemistry & Nutrition, May 23-25, 2018, Canada; 8th International Conference on Food Safety & Regulatory Measures, June 11-13, 2018, Spain; International Conference on Food Security and Nutrition, Jul 16-17, 2018, Netherlands. New South Wales Food Authority, UK; American Dairy Products Institute, USA; National Frozen Food Association, USA; Institute of Food Technologists, UK; International Association of Food Industry Suppliers, USA; International Bottled Water Association, USA. Fermentation has been utilized for quite a long time to make sustenance items more elegant and longer-enduring. Today it is likewise utilized as a practical option for the generation of particular synthetic concoctions and sustenance fixings which are as yet being made with engineered, fossil-based procedures. Wageningen Food and Bio-based Research has a solid reputation on maturation innovation for sustenance items and synthetic compounds. With our exceptional lab-to-pilot approach we offer organizations novel chances to locate the most savvy course to a given maturation process. Food production contributes, for example, to climate change, eutrophication and acid rain, as well as the depletion of biodiversity. It is also a considerable drain on other resources, such as nutrients, land area, energy, and water. In Finland, approximately half of the amount of both phosphorus and nitrogen that ends up in the Baltic Sea due to human activity is attributable to agriculture. Farming techniques have evolved, and the use of fertilizers has decreased considerably during the last few decades. Despite this, there appears to be no decrease in nutrient loading attributable to agriculture. The Natural Resources Institute Finland is developing new solutions for improving production techniques, maximizing the use of by-products, and minimizing waste in order to reduce the nutrient loading attributable to production. The aim of the Natural Resources Institute Finland is to find ways of mitigating the environmental and climatic impacts of food production. A drug interaction is notices to the substance which influences the action of a medication, i.e. the impacts are expanded or diminished, or they create another impact that neither items by their own. These associations happen when your sustenance and drug hinder with each other. Associations among nourishment and medications may accidentally abatement or increment the medication impact. International Conference on Food & Nutrition, July 25-26,2018, Canada; 20th International Conference on Food Security and Nutrition, June 14 - 15, 2018, Austria. The study of chemistry probably dates from the first millennium AD and the route to modern food chemistry can be traced through the alchemist philosophies of medieval China, India and Europe, although it took about a thousand years for chemistry to grow into a coherent and inclusive discipline. The marriage of chemistry and biology led to many progeny, including agricultural chemistry, biological chemistry, food chemistry, industrial chemistry and pharmaceutical chemistry. Food Chemistry is an overview of chemistry related to food sciences, such as food analysis, microbiology, nutrition, and food engineering etc. Food chemistry deals with food and Sustenance. Now there are some emerging new trends in college education.There is increasing emphasis on improving learning and teaching (L&T) quality, measuring student based learning outcomes, and improving core competencies. Teaching loads for most faculties are increasing. All this points to a need for better efficiency. Perhaps through improved study skills, better teaching methods, and increased distance learning. After decades of teaching food chemistry it is noticeable that these trends bring with them constraints and challenges for the students, Researchers, Industrialists. Educational opportunities: No matter how experienced you are at your business, everyone can learn. Working in research projects or business venture one can often be isolating and without exposure to a variety of points of view, we can miss new ideas and trends that can impact future results. The educational aspect this conference can expose you to new ways of conducting your business and help you discover how to be more productive. Networking with peers: Food Chemistry 2019 conference will provide a great opportunity to network. Often competitors from other regions of the country can become valuable resources for referrals and best-practices. Avoiding peers for fear of others discovering your competitive advantage can actually limit your own success. Collaboration is the way to approach networking. While there are those whose intentions can be suspect, most people can help each other uncover ideas and spark inspiration when they get to know each other on a personal level. Expand your Business: Food Chemistry 2019 is a place where you can learn more about the current business climate. Discovering innovative products and services for your business is necessary to stay competitive in today’s fast-paced world. Plus, these vendors who sell to your industry fully grasp what is happening inside your competition. Invest time with the sponsors at the event and turn them into your friends and allies. Position yourself as an expert. When you are active in your research and industry, you can develop a reputation as an expert to your peers and your clients. Those who are engaged over the long term are often asked to speak at the events and to write articles for their publications. Like it or not, others like to associate with the experts in any field. Clients feel good about doing business with those that are celebrated by their peers. If your strategy is to be the best-kept secret in your business community and research area, you will be missing a valuable opportunity. Conference Series LLC Ltd successfully hosted the 3rd International Conference on Food Chemistry & Nutrition during May 16-18, 2018 at Montreal, Canada. The conference focused on the theme “Shaping the Future of Food Quality, Health & Safety”. The conference was successful in gathering eminent speakers from various reputed organizations and their paramount talks enlightened the gathering. The pragmatic meet organized by Conference Series LLC Ltd received generous response from the Editorial Board Members of Journals as well as expertise from academia, talented researchers and young student community. Researchers and students who attended from different parts of the world made the conference one of the most successful events in 2018 from Conference Series Group. The conference was marked with the presence of renowned Speakers, Young Researchers, Students and Business Delegates driving the three day event into the path of success with thought provoking keynote and plenary presentations. We heartily congratulate the winners of the Poster Competition and Young Research Forum Competition and appreciate all the participants who put their efforts in poster presentations and Young Researchers and sincerely wish them success in future endeavours. We extend our heartiest thanks to all the Organizing Committee Members for their kind support rendered towards the success of Food Chemistry-2018. At the same time we take the opportunity to thank all the speakers, delegates and participants for providing their valuable contribution and time for Food Chemistry-2018. Food Chemistry-2018 Organizing Committee would like to thank the Chair of the conference, Ozlem Tokusoglu, Celal Bayar University, Turkey who contributed a lot for the smooth functioning of this event. 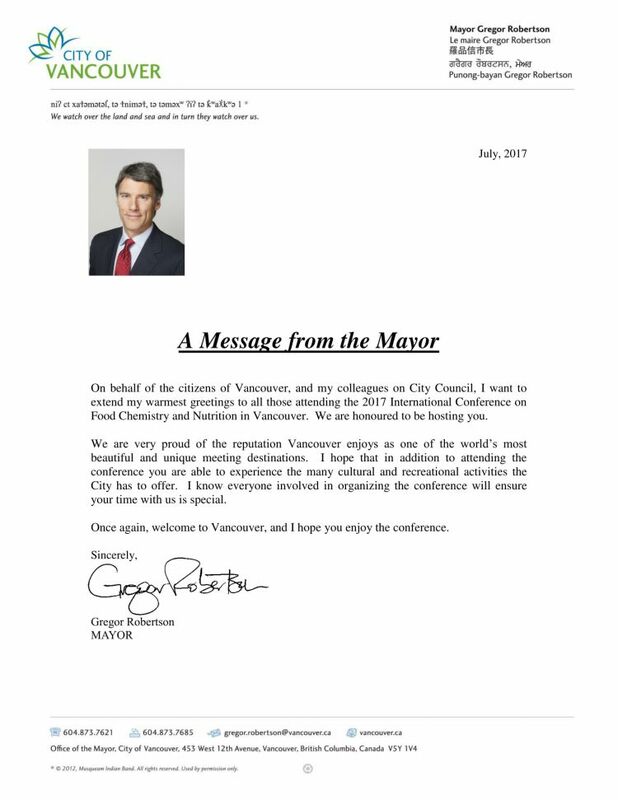 With the encouragement from the enormous feedback from the participants and supporters of Food Chemistry 2018, Conference Series LLC Ltd is glad to announce 4th International Conference on Food Chemistry & Nutrition (Food Chemistry-2019) during July 26-27, 2019 in Vancouver, Canada. Conference Series LLC Ltd successfully hosted the 2nd International Conference on Food Chemistry & Nutrition during July 24-26, 2017 at Vancouver, British Colombia, Canada. The conference focused on the theme “Where Food Meets Science: Exploring Recent Advances in Food Research and Business”. The conference was successful in gathering eminent speakers from various reputed organizations and their paramount talks enlightened the gathering. The pragmatic meet organized by Conference Series LLC Ltd received generous response from the Editorial Board Members of Journals as well as expertise from academia, talented researchers and young student community. Researchers and students who attended from different parts of the world made the conference one of the most successful events in 2017 from Conference Series Group. The conference was marked with the presence of renowned Speakers, Young Researchers, Students and Business Delegates driving the three day event into the path of success with thought provoking keynote and plenary presentations. We heartily congratulate the winners of the Poster Competition and Young Research Forum Competition and appreciates all the participants who put their efforts in poster presentations and Young Researchers and sincerely wish them success in future endeavours. We extend our heartiest thanks to our Exhibitor College of Agriculture & Bio resources, University of Saskatchewan, Canada for their kind support rendered towards the success of Food Chemistry-2017. Food Chemistry-2017 Organizing Committee would like to thank the Moderator of the conference, Thaddao Ogren & Nianjie Ziang from PepsiCo, USA who contributed a lot for the smooth functioning of this event. With the encouragement from the enormous feedback from the participants and supporters of Food Chemistry-2017, Conference Series LLC Ltd is glad to announce 3rd International Conference on Food Chemistry & Nutrition (Food Chemistry-2018) during May 16-18, 2018 in Montreal, Canada.